Indiana University East awarded five scholarships for the 2017 Summer Research Scholar Program. Graduate and undergraduate students receive $2,000 to conduct a research project under the supervision of a faculty mentor. School of Humanities and Social Sciences Dean Ross Alexander has been named as the vice president for Academic Affairs and Provost at the University of North Alabama (UNA) in Florence, Ala. He begins his new role at UNA July 1, 2017. While preparing for the Miami Open in Key Biscayne, Fla., Shelby Rogers was also making arrangements to talk with her academic advisor at Indiana University East so that she could register for summer and fall classes. The Indiana Court of Appeals will visit Indiana University East at 11 a.m. on Thursday, March 23, to hear oral argument. The court case will be argued in Vivian Auditorium, located in Whitewater Hall. Music faculty from Indiana University East and Earlham College will perform in concert from 7-8:30 p.m. on Thursday, February 16, at IU East’s Room 912, located at 912 E. Main Street in Richmond. Indiana University East has faculty available to discuss the election on a local, state and national level. Ross Alexander, dean of the School of Humanities and Social Sciences, and Chera LaForge, assistant professor of political science, will be available to discuss this year’s election. Creative writing faculty from the Indiana University East School of Humanities and Social Sciences (HSS) will host creative writing workshops the first Saturday of every month from 2-3:30 p.m. at IU East’s Room 912, located at 912 E. Main St. in Richmond. Indiana University East is pleased to welcome new faculty this semester. Faculty are listed below under the school in which they teach. 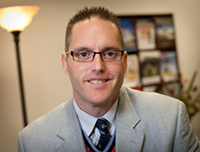 Brandon Smit, assistant professor of business administration and management, received his Ph.D. in Industrial-Organizational Psychology, his Master of Science in Industrial-Organizational Psychology and his Bachelor of Science in Psychology from Saint Louis University.